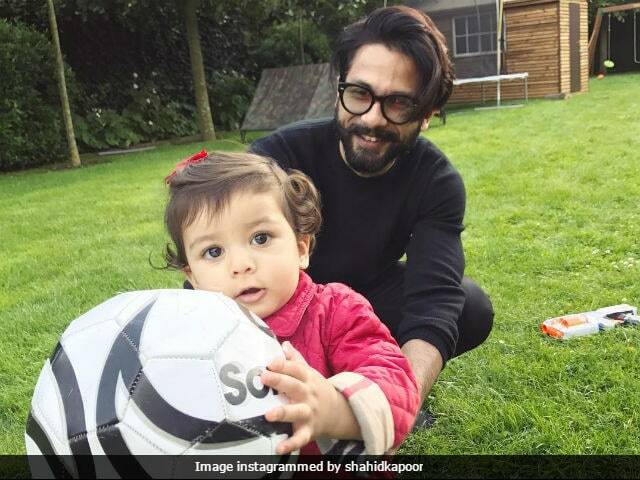 Actor Shahid Kapoor's daughter Misha celebrated her first birthday on August 26. The 36-year-old actor, who is currently on a vacation with wife Mira Rajput and Misha, thanked all his fans and followers on Twitter for their warm wishes on his little one's first birthday. "Thank you all for all the wonderful wishes. Loads of love from Misha Mira and me. And a very happy ganesh chaturthi to all," tweeted Shahid Kapoor. The Haider actor flew out of Mumbai along with Mira and Misha earlier this month. Shahid Kapoor and Mira Rajput got married in July 2015 and they welcomed Misha a year later in August. Thank you all for all the wonderful wishes. Loads of love from Misha Mira and me. And a very happy ganesh chaturthi to all. A day before Misha's first birthday, Shahid Kapoor posted a picture on social media in which he is seen carrying Misha in his arms and posing for the camera while Misha seems to be more interested in seeing what's happening around her. Misha looked absolutely adorable dressed in a grey outfit and nibbling her fingers. Last week, Shahid also shared a picture, in which Misha was sandwiched between Mira and him. "Best times," he wrote. Here are some more pictures from Shahid Kapoor's vacation diary. On the work front, Shahid Kapoor is busy shooting for Sanjay Leela Bhansali's Padmavati, co-starring Deepika Padukone and Ranveer Singh. He is training in sword fighting and martial arts for his role as Raja Ratan Singh in the film. Deepika plays the titular role in Padmavati, while Ranveer will feature as Alauddin Khilji. Padmavati is scheduled for release in November this year.